The batter for this crispy, golden fried chicken wings from rapper and culinary star (have you seen the tv cooking show “Martha & Snoop’s Potluck Dinner Party” ? ), Snoop Dogg, has a secret ingredient: potato chips. Use any type of potato chips you like—sour cream and onion, jalapeño, or salt and vinegar would all work well. Snoop was partial to using BBQ chips in the show with Martha. To really get that BBQ chip flavor in the final result, though, don’t be afraid to add a bit more chips to the coating than the recipe calls for. The recipe also called for the use of cornmeal in the batter. Personally, I would leave out the cornmeal because it makes the batter to grainy. A few other adjustments were made as well, like using a cut up whole fryer chicken instead of wings. I also used plain potato chips. To be perfectly honest. I prefer my Grand’s recipe for fried chicken, where she would brine the bird in buttermilk over night in the refrigerator, making for a juicer and more tender chicken. I would give this recipe a B- overall. The corn meal, as I mentioned before, really doesn’t work in this recipe. The chicken was tasty, by the coating doesn’t adhere very will to the chicken, even after air drying 30 minutes prior to frying. The recipe below is featured in: “Snoop Dogg’s Fried Chicken Is Game-Changing & You Should Make it Right Now.” From the book, From Crook to Cook by Snoop Dogg, Chronicle Books, 2018. Fill a large pot with 5 cups of water. Place the pot over high heat and bring to a boil. Add the sugar, salt, bay leaf, red pepper flakes, and orange peel. Cook, stirring, until the sugar and salt dissolve, about 1 minute. Remove from the heat and let cool. Place the chicken in a large bowl and cover completely with the cooled brine. Cover and refrigerate for 10 to 12 hours, and up to 24 hours. 3. Remove the chicken from the brine and pat dry with a paper towel. Set the chicken aside and discard the brine. To batter the chicken: In a large bowl, stir together the flour, cornmeal, crushed potato chips, garlic powder, cayenne, baking powder, black pepper, and salt until combined. Transfer to a large shallow dish. Place another large shallow dish next to the flour mixture and add the buttermilk to it. Place a wire rack or pan next to the two dishes; this will be where you set your battered chicken. Take one wing and submerge it in the buttermilk. Lift and let any excess drip back into the dish. Roll the wing in the flour mixture, coating it completely. Place the battered chicken wing on the wire rack or pan and repeat with the remaining wings. Let the wings dry for 20 to 30 minutes before frying. To fry the chicken: In a large Dutch oven over medium heat, heat the canola oil to 350°F. Place a wire rack over a plate or line a pan with brown paper and set aside. Working in batches, carefully add the chicken wings to the hot oil, careful not to crowd, otherwise they’ll become greasy. Once the chicken is added, the oil’s temperature will drop to between 300°F to 320°F. Watch and adjust the heat to maintain a consistent 350°F temperature. Fry the wings for 8 to 10 minutes, or until golden. If the chicken is getting too dark, lower the heat. Once the chicken is done, remove each piece with tongs and transfer to the prepared rack or pan to drain. Sprinkle generously with salt. Let the oil come back to temperature before adding the next batch; repeat with the remaining chicken. Serve the wings with plenty of hot sauce (if using) or over buttermilk waffles, hot or cold, however you like them. Starting in late December, pastry shops in Paris start jumping the gun, and windows and showcases begin filling up with Galettes des rois, or King Cakes, in anticipation of the celebration of Epiphany, held on January 6th. The French have been serving up galette des rois since the 14th-century. Traditionally, the season of the galetter des rois begins on Twelfth Night and ends on Shrove Tuesday. The cake is served on January 6th – the 12th day of Christmas – to celebrate the Epiphany, commemorating the arrival of the Wise Men, Melchior, Caspar and Balthazar, who travelled from the three continents, Asia, Africa and Europe, to the manger in Bethlehem, where Jesus was born, to present their gifts. Today, it’s eaten throughout the month of January and is simply a festive way to celebrate the new year with family and friends, regardless of religious background. Composed of a puff pastry cake, with a small charm, the fève, hidden inside, it is usually filled with frangipane, a cream made from sweet almonds, butter, eggs and sugar. But more gourmet versions are available for us to enjoy, with chocolate, apple or candied fruits. Every year, the leading French pâtissiers offer exclusive creations for the tradition of crowning the one who finds the fève. Like many Christian festivals, the date of Epiphany corresponds to what was originally a pagan festival. In the past, the Romans celebrated Saturnalia, the festival of the winter solstice, at which a king or queen was chosen for one day, by means of a fèves : a white or black bean baked inside a loaf of bread and the person who found the bean was crowned king for the day. The item baked into the cake is called a fève, which means “bean”, a broad bean to be exact, which was the original king selector. In the 18th century, the fève was a porcelain figurine representing the nativity, in particular, the Baby Jesus. At the end of the 19th century, the beans were replaced by porcelain figurines. Even though the trinkets in the cake are no longer beans, they are still called fèves. They might be tiny santons (nativity figures), cartoon characters, or any number of other things. There are collectors of these fèves and even a fève museum. If you are lucky, you might find a fève like one of these in your slice of cake. Today, the fèves get more and more creative as well: some boulangeries (bakeries) create special collections of fèves depicting modern themes from great works of art, to classic movie stars, or even popular cartoon characters. Naturally, if you are making your own galette, you will need to buy your own fève, which can be bought here: http://www.fevesdumonde.com. Nowadays there is a wide range of different fèves which are much sought-after by collectors. The family tradition is for everyone to gather together to cut the famous cake. The youngest child goes under the table and points out the guests, who are then given their portion of the cake. A cardboard crown is supplied with the cake. The one who finds the fève is crowned and chooses his or her queen or king. The Christian church changed the solstice celebration to the Epiphany and fixed the date as the 6th of January. With the “king for a day” theme already established, it became the time to remember the kings who presented gifts to the baby Jesus. Over the years, the bean-in-the-bread turned into a bean-in-the-cake and became known as the galette des rois, “cake of the kings”. In 16th century Paris, this king cake was at the center of a conflict between the boulangeries (bakeries) and the patisseries (cake shops). They each wanted the sole rights to make and sell it. The cake shops won, but the bakeries weren’t about to give up so easily. If they were forbidden to make king cakes, then they would make king pies. And this is why there are two very distinct versions of king cake today. In the south of France, you will be eating a circular cake made of a sweet brioche-style dough with a hollow circle in the center. The cake is then covered with a variety of candied fruits. In northern France, the galette des rois favored by most of the French populous is in its simple version that looks more like a pie made of a pâte feuilleté, flaky puff pastry, filled with frangipane, a cream made from sweet almonds, butter, eggs and sugar. The galette is then decorated with notches incised across the top of it and browned in the oven. It is said that frangipane was invented as scent to perfume the leather gloves of King Louis XIII that were made by a Florentine nobleman, the Marquis of Frangipani. Soon after Frangipani, living in France, released his fragrance made from bitter almonds to the public and the local patisseries created a cream made with milk, sugar, flour, eggs, butter and ground almonds. They named it frangipane. Little could 16th century Frangipani, have guessed that the scent would inspire pastry chefs for centuries to follow. Other variations of the galette can be found as well, from shortbread-style, popular in Western France, to those that have alternate fillings, such as chocolat-poire (chocolate-pear) or raspberry. Abroad, the famous galette des rois has a lot of fans, notably at Belgian and Dutch tables. There are customs of eating king cakes in a number of countries with the festival of Epiphany at the end of the Christmas season; in other places, such as New York, London and Berlin In New Orleans, Louisiana, king cakes are associated with the pre-Lenten celebrations of Mardi Gras and Carnival. The cake with the fève is a long-standing tradition which is still very popular today. At January gatherings, when it is time to serve the cake, the youngest child gets under the table. Tradition also dictates that when serving galette des rois, the host or hostess cuts the entire cake such that each guest receives a slice, plus an extra, symbolic slice for any unexpected visitor, or poor person, that should pass by. In this way, everyone has the opportunity to “tirer les rois,” – or “draw the kings” – from the cake. The child is then asked by the host or hostess, “Who is this piece for?” The child calls out a name and the cake is distributed according to his instructions. This way there can be no cheating, as the child cannot see the fève and play favorites. Everyone chews their piece of cake very slowly, to avoid cracking a tooth, until the fève is found. Whoever finds the fève becomes the king (or queen) for the day. They get to wear a paper crown which is supplied with the cake, if bought from a French bakery. The king’s or queen’s responsibility is to bring another king cake to the next gathering – and that probably means the following week because the French eat these cakes during the entire month of January. This way everyone gets a chance to find the fève, wear the crown, and be king or queen of the party. The pleasure brought by a galette des rois isn’t merely due to its delicious taste – it’s also the anticipation of wondering whether you will be the lucky one to discover la fève, a tiny charm, buried inside one of the slices. The good thing about making your galette own is that you can customize the almond filling, to your taste. So who will become king or queen for the day at your house? Bake a galette and have a little fun with the family. Make a foil or paper crown to place atop the cake before eating it (if you buy it at a bakery in France, they will provide the crown). If you are lucky enough to find the fève, you’re “king for a day” and take your place in a 700-year old French tradition. In a medium mixing bowl, combine the almond flour, sugar, flour, orange zest and salt. Cut in the butter until incorporated. Stir in the egg, cognac almond extract, vanilla extract. Cover with plastic wrap and chill in the refrigerator for up to 1 hour. Roll the two pastry sheets to 10-inch squares. Using a pie plate or other round object, cut 2 10-inch circles. Place one circle on your lined baking sheet. Spread the apricot jam in the center, leaving a 2 inch edge. Top with the chilled almond filling. Place the almond in the filling, if desired. Brush water over the edge of the bottom circle. 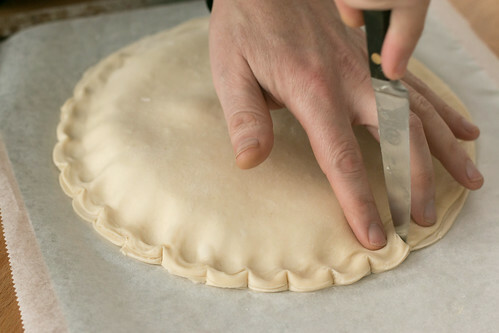 Top with the second pastry circle and pinch along the edge to seal. To crimp, use your thumb and pointer finger together, pressing the back of a paring knife into the edge to create the crease. Continue around the entire tart. Whisk together the egg yolk and cream. Brush over the entire tart. Decorate the tart by scoring the tart with a pairing knife to leave indentations. Bake for 30-35 minutes, until golden brown. Allow to cool slightly before cutting. King cakes of the type locally called “French style” on display at the chain bakery/restaurant “La Madeline” branch in Carrollton, New Orleans. Note they come with cardboard “crowns” to be worn by whoever gets the slice with the token and becomes monarch of the event. All photographs and content are copyright protected. Photography credits from other sources are noted were applicable. Please do not use these photos without prior written permission. If you wish to republish this photograph and all other contents, then we kindly ask that you link back to this site. We are eternally grateful and we appreciate your support of this blog. Photo Credit: Giant Foods, 2018. For a festive touch, try these champagne jellies, and serve these gummy-like champagne treats during your New Year’s Eve party. Your guests can eat them on their own or try dropping them into a glass of wine for a fun treat. Sprinkle the gelatin into ½ cup water and let stand 5 minutes. In a medium pot, combine the champagne and sugar and heat to a simmer on medium-high. Add the gelatin mixture and whisk until fully dissolved. Remove from heat and let cool slightly. Line a 9×13-inch baking dish with parchment paper. Pour the champagne mixture into the dish and refrigerate 30 minutes or until chilled but not set. Sprinkle glitter over the mixture. Return to the refrigerator and chill another 30 minutes, until fully set. Using a sharp knife, cut the jelly into mini squares. Place on a platter and serve with decorative toothpicks. Each gelatin packet equals 1 tablespoon. For a more polished look, use star-shaped cookie cutter to cut the jelly with crisp clean edges.